Henry Holt and Co. (BYR), 9780805099065, 336pp. Twelve-year-old Edward Sullivan has always dreamed of becoming a spy like the ones he reads of in his favorite sci-fi magazine, Thrilling Martian Tales. Instead, he spends his days keeping his eccentric family from complete disaster . . . that is, until the villainous archaeologist Sir Titus Dane kidnaps Edward's parents as part of a scheme to loot an undiscovered dragon tomb. 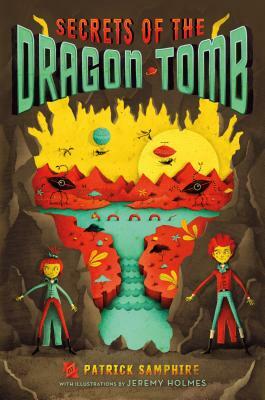 Edward sets out on a perilous journey to save his parents and protect the dragon tombs in the process. Turns out spywork is a bit more challenging than he had imagined. . . .
Patrick Samphire grew up in England and Zambia. He holds a PhD in physics from the University of Essex and attended the Clarion Writers Workshop in Seattle. He lives in Wales with his family. Secrets of the Dragon Tomb was his debut novel. Jeremy Holmes is the creative mind behind Mutt Ink, a graphic design studio, and the illustrator of many children's books. His first book, There Was an Old Lady, was awarded Bologna Razzi’s Opera Prima award at the 2010 Bologna Book Fair. He lives in Pennsylvania.